I Finished Reading Kerri’s Book | A Consequence of Hypoglycemia. Last week I finally finished reading Kerri Sparling’s Balancing Diabetes: Conversations About Finding Happiness and Living Well. I was given an advanced copy of the book around Christmas time. While a formal review was not required, this thing is too good to not share some thoughts with the rest of you. I also contributed to one of the chapters, but we’ll get to that. Here’s the short version: If you know Kerri, if you like her style (at sixuntilme.com), if you are someone living with diabetes – recently diagnosed or a proud recipient of a 25 year Joslin medal, or if you are caring for someone with diabetes…this book is required reading. It’s fantastic. Before we get going, I want you to know that I plan on featuring Kerri and some of the other contributors in an upcoming episode of my podcast, so this won’t be the last you hear about this book from me. First, some context for my comments. Kerri was the first person I found in the diabetes online community. She was the third person I followed on Twitter. This blog exists because of Kerri – she’s the reason I started blogging. In a weird way, I can give her the assist onn most of the great that has happened to me in the past 4+ years. Without this blog, I wouldn’t have my podcast, I wouldn’t have my diabetes under control, and most importantly, I wouldn’t have Dayle. Kerri has always been a good friend and a great role model for the diabetes online community. I’ve asked her about the pressure she can feel from time to time by being placed in such a high regard by so many and she often brushes away those compliments, not an unexpected reaction considering how modest she is despite her prominence in the patient advocacy world. But it can be a daunting task having so many people look up to you. I’m not sure if this means you should take these comments about her book with a grain of salt, but I figured I should state my biases right away. You know, disclosure and all. Balancing Diabetes covers the topics that a person with diabetes cares about that aren’t discussed the day you are diagnosed. From the family dynamics, to college life. From exercise with diabetes, to travel preparations. From romantic relationships, to parenting. This book touches on all of these topics and more with Kerri’s usual wit, sass, and approachable writing style. I haven’t read every book on diabetes there is, but the ones I have read tend to lean heavier on medical terms and formal language and phrasing. Balancing Diabetes reads more like a conversation among friends. We know what things are supposed to be called, and we have no problem using technical terms, but when this information is presented in a casual nature, it’s easier to read and easier to connect with. The kicker with this book, and something I didn’t realize until I had the final copy syncing with my Kindle app, is that this isn’t just Kerri’s story. While Kerri’s mother, siblings, college roommates, or husband are featured in almost every chapter, there’s also at least one, sometimes up to four or five additional perspectives from the diabetes community on the chapter’s core theme. When Kerri first reached out to me and Dayle to get our feedback on some questions for her chapter on relationships, it never occurred to me that she would be doing this for every chapter. Seeking out a variety of viewpoints and opinions from throughout the diabetes community to help present a well-rounded approach to each topic is a genius idea. I’m sure it could be easy to approach writing a book about your life with diabetes and keep everything in the first-person, with no outside input. “This is how I do it. The end.” But someone like Kerri would never do something like that, and that’s why she’s awesome. And that’s why this book is great. If you’re reading this, then you’ll recognize most of the names of diabetes community contributors throughout the 200 pages, but I don’t want to spoil the surprise of who is where. Simply put, this book is a wonderful extension of the kind of person and diabetes advocate Kerri is. We’re all made better by the community, as a whole, and the community’s additions to Kerri’s words help make this book a necessary addition to anyone’s library. As mentioned, I helped contribute to the chapter on relationships. Living with and being engaged to someone with diabetes presents some interesting moments of insight that is a bit rare for outsiders. The way contributing quotes flow with Kerri’s own words is quite magical. I’ll be sure to ask about that process of weaving a narrative with multiple people when I get the opportunity, that’s a task that could easily get out of hand if you let it. This book doesn’t set out to provide all the answers. It won’t tell you how to properly count carbs, or what exercises are best, or if an insulin pump is right for you. But it will reassure you that balancing life and diabetes is possible – I guess that makes the title fitting. Kerri doesn’t write as a medical authority on any of this stuff, none of us do. But some times it just takes a reassuring “it’ll be okay” or “you can do this“, to help us along the tricky path that is this silly, incurable disease. I can’t recommend Balancing Diabetes enough. Trust me, you want to read this thing when it’s out in a month. It’s great. 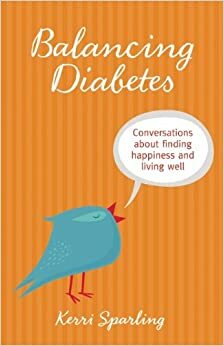 Balancing Diabetes: Conversations About Finding Happiness and Living Well is available for preorder on Amazon.com, gracing bookshelves on March 4, 2014. Disclosure: I was provided an advanced digital copy of Balancing Diabetes. I also contributed to one of the chapters in the book. All of this could interfere with my thoughts on the book, but it’s plenty great on its own without needing to buy my opinion. Also, Kerri didn’t ask me to write anything about it. She would probably ask that I tone down the “Kerri is awesome” stuff if she did. But I believe in this book, and in Kerri, so here I am. Great review, glad I read this. Now I’m sold, I’m going to have to get the book.